"Kodaly" redirects here. For other uses, see Kodaly (disambiguation). The native form of this personal name is Kodály Zoltán. This article uses Western name order when mentioning individuals. 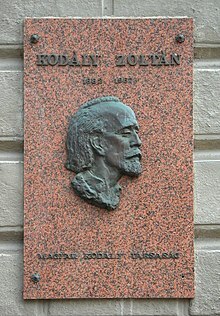 Zoltán Kodály (/ˈkoʊdaɪ/; Hungarian: Kodály Zoltán, pronounced [ˈkodaːj ˈzoltaːn]; 16 December 1882 – 6 March 1967) was a Hungarian composer, ethnomusicologist, pedagogue, linguist, and philosopher. He is well known internationally as the creator of the Kodály Method. Born in Kecskemét, Hungary, Kodály learned to play the violin as a child. In 1905 he visited remote villages to collect songs, recording them on phonograph cylinders. In 1906 he wrote a thesis on Hungarian folk song, "Strophic Construction in Hungarian Folksong". At around this time Kodály met fellow composer and compatriot Béla Bartók, whom he took under his wing and introduced to some of the methods involved in folk song collecting. The two became lifelong friends and champions of each other's music. Kodály's first wife was Emma Gruber (née Schlesinger, later Sándor), the dedicatee of Ernő Dohnányi's Waltz for piano with four hands, Op. 3, and Variations and Fugue on a theme by E.G., Op. 4 (1897). In November 1958, after 48 years of the most harmonious marriage Kodály's first wife Emma died. In December 1959, Kodály married Sarolta Péczely, his 19-year-old student at the Franz Liszt Academy of Music with whom he lived happily until his death in 1967 at the age of 84 in Budapest. Throughout his adult life, Kodály was very interested in the problems of many types of music education, and he wrote a large amount of material on teaching methods as well as composing plenty of music intended for children's use. Beginning in 1935, along with his colleague Jenő Ádám (14 years his junior), he embarked on a long-term project to reform music teaching in Hungary's lower and middle schools. His work resulted in the publication of several highly influential books. The Hungarian music education program that developed in the 1940s became the basis for what is called the "Kodály Method". While Kodály himself did not write down a comprehensive method, he did establish a set of principles to follow in music education, and these principles were widely taken up by pedagogues (above all in Hungary, but also in many other countries) after World War II. See also: Kodály Hand Signs. In the motion picture Close Encounters of the Third Kind, a visual learning aid distributed to members of a conference of ufologists was named the "Kodály Method" and referenced musical notes as hand signals. The city of Pécs commissioned a full-length bronze statue, located in Szent István square, in his honour in 1976. According to the wishes of the sculptor, the work stands with its back to the Cathedral and facing a former playground, so that it was facing children, whose musical education was the most important thing in Kodály's life. He is depicted as a fragile old man, who walks almost imperceptibly among the horse-chestnut trees. See also: Category:Compositions by Zoltán Kodály. ^ Ilona von Dohnányi; James A. Grymes (12 July 2002). Ernst von Dohnányi: A Song of Life. Indiana University Press. ISBN 978-0253109286. ^ David Mason Greene (2007). Greene's Biographical Encyclopedia of Composers. The Reproducing Piano Roll Foundation. pp. 1122–1123. ISBN 978-0-385-14278-6. ^ "Kodály Center for Music Education :: The Kodály Philosophy". ^ "Kodály Statue – Pécs". www.iranypecs.hu. Retrieved 14 July 2018. Wikimedia Commons has media related to Zoltán Kodály.